Sometimes you have to deal with binary response variables. In this case, several OLS hypotheses fail and you have to rely on Logit and Probit. Good afternoon Guys, I hope you are having a restful Sunday! Today we will broadly discuss what you must know when you deal with binary response variable. Even though I don’t want to provide you a theoretical explanation I need to highlight this point. OLS is known as a Linear Probability Model but, when it comes to binary response variable, it is not the best fit. 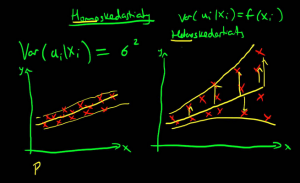 Moreover, there are several problems when using the familiar linear regression line, which we can understand graphically. As we can see, there are several problems with this approach. First, the regression line may lead to predictions outside the range of zero and one. Second, the functional form assumes the first observation of the explanatory variable has the same marginal effect on the dichotomous variable as the tenth, which is probably not appropriate. Third, a residuals plot would quickly reveal heteroskedasticity and a normality test would reveal absence of normality. Logit and Probit models solve each of these problems by fitting a nonlinear function to the data and are the best fit to model dichotomous dependent variable (e.g. yes/no, agree/disagree, like/dislike). The choice of Probit versus Logit depends largely on your preferences. Logit and Probit differ in how they define f(). 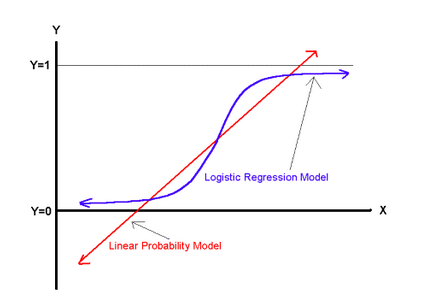 The logit model uses something called the cumulative distribution function of the logistic distribution. The probit model uses something called the cumulative distribution function of the standard normal distribution to define f (). Both functions will take any number and rescale it to fall between 0 and 1. Hence, whatever α + βx equals; it can be transformed by the function to yield a predicted probability. If you are replicating a study, I suggest you to look through the literature on the topic and choose the most used model. Enough Theory for today! Remember that Probit regression uses maximum likelihood estimation, which is an iterative procedure. In order to estimate a Probit model we must, of course, use the probit command. Nothing new under the sun. The above output is made by several element we never saw before, so we need to familiarize with them. The first one is the iteration log that indicates how quickly the model converges. The first iteration (called Iteration 0) is the log likelihood of the “null” or “empty” model; that is, a model with no predictors. At each iteration, the log likelihood increases because the goal is to maximize the log likelihood. When the difference between successive iterations is very small, the model is said to have “converged” and the iterating stops. 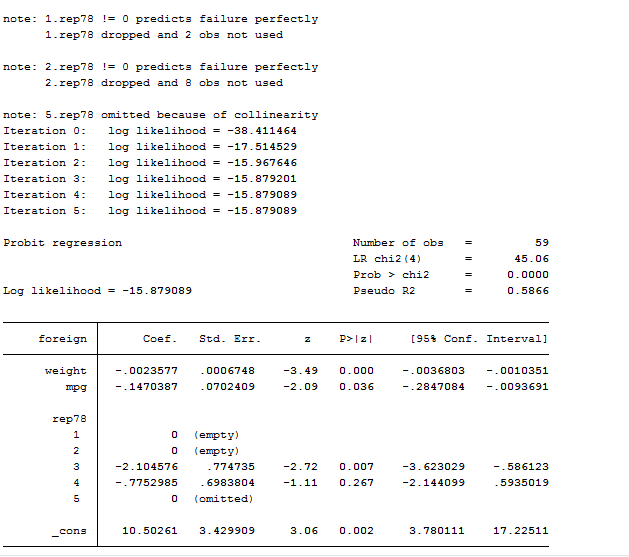 On the top right part, we can find the Likelihood Ratio Chi-Square Test (LR chi2) and its p-value. The number in the parentheses indicates the degrees of freedom of the distribution. Instead of R-squared we find the McFadden’s Pseudo R-Squared but this statistic is different from R-Squared and also its interpretation for the Probit model differs. 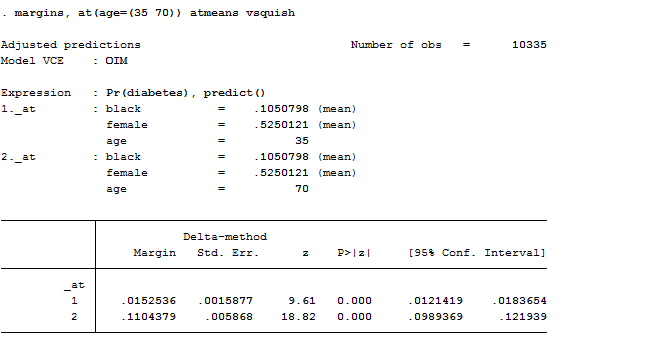 The Probit regression coefficients give the change in the z-score for a one unit change in the predictor. I added a factor variable who was mainly dropped due to multicollinearity. As we already discussed in the post related to OLS regressions, there are several options available for this command like: vce(robust), noconstant, ect. If you missed the post, review it here. After having performed the regression, we can proceed with post estimation results. We can test for an overall effect of rep78 using the test command. Below we see that the overall effect of rep78 is statistically insignificant. 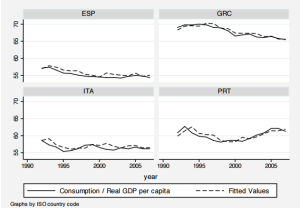 We can also test additional hypotheses about the differences in the coefficients for different levels of rep78. Below we test that the coefficient for rep78=3 is equal to the coefficient for rep78=4. 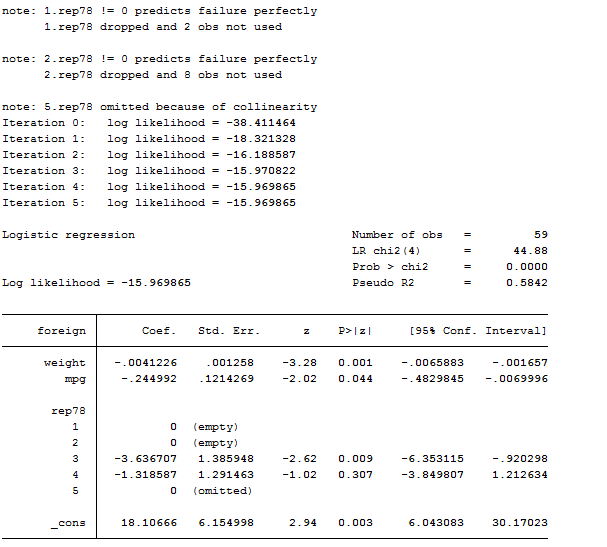 Then predict the probabilities from the probit after having called the regression command. predict is the command that gives you the predicted probabilities that the car type is foreign, separately for each observation in the sample, given the type’s regressor. Look at the R-Squared. The models are practically equals. Feel free to switch between probit and logit whenever you want. The choice should not generally significantly affect your estimates. There is almost no difference among logistic and logit models. The only thing that differs is that –logistic- directly reports coefficients in terms of odd ratio whereas if you want to obtain them from a logit model, you must add the or option. We can think about logit as a special case of the logistic equation. They both support the by() and if options and several others we have already reviewed. As we can observe, results show that getting older is bad for health but it seems to be unrelated with gender. The problem here is that we are not able to fully understand how bad it is to be old. As we can observe, a 35 year old has less than 2 percent chance of having diabetes whereas a 70 year old has an 11 percent change. 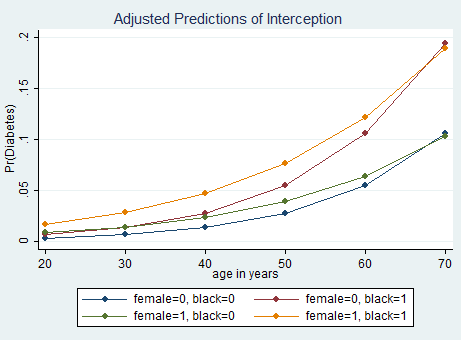 I used the expression “average” to indicate that I took mean values for the other independent variables in the model (female, black). However, this is an old command that is still on usage on Stata but it may be replaced easily by margins. There are several useful options of margin. The first one you can use is post that allows the results to be used with post-estimation command like test. Another one is predict, which allows you to obtain probabilities or linear predictions (i.e. predict(xb)). If we want to get the discrete difference in probability, we can use the dydx() option with the binary prediction. This option requests margins to report derivatives of the response with respect to the variable specified. Eyex() reports derivatives as elasticity. It finds the average partial effect of the explanatory variable on the probability observing a 1 in the dependent variable. This is taking the partial effects estimated by the logit for each observation then taking the average across all observations. This is extremely useful because the direct results of the logit estimations can not be directly interpreted as partial effects without a transformation. The smaller and correct estimate is not of 10.3 percent. Try to believe it. 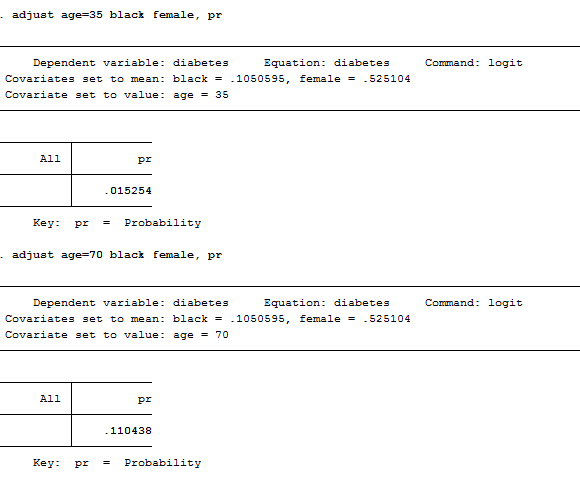 By doing this, Stata knows that if age=79 then age2=4900 and it hence computes the predicted values correctly. What about interaction terms? 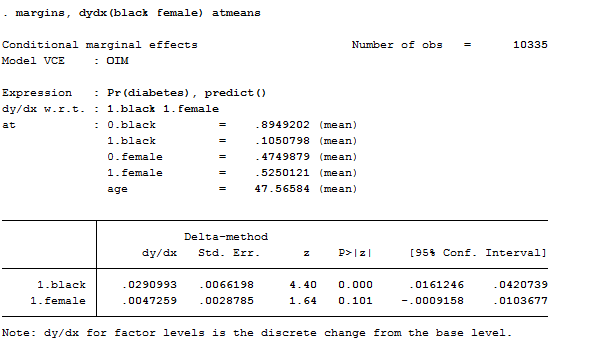 This result tells us that, if you have two otherwise-average individuals, one white and the other black, the black’s probability of having diabetes would be 2.9 percentage points higher. It can also be helpful to use graphs of predicted probabilities to understand and/or present the model. 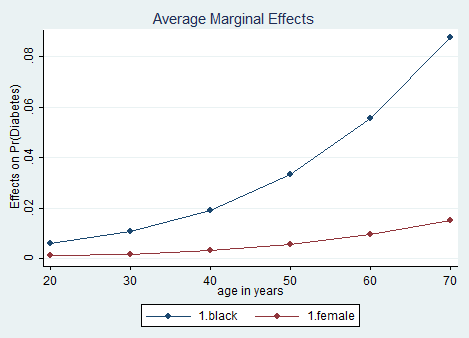 If we want to graph marginal effects for different ages in black people, we see that the effect of black differs greatly by age. How can we do that? Luckily, with the marginsplot command introduced in Stata 12. 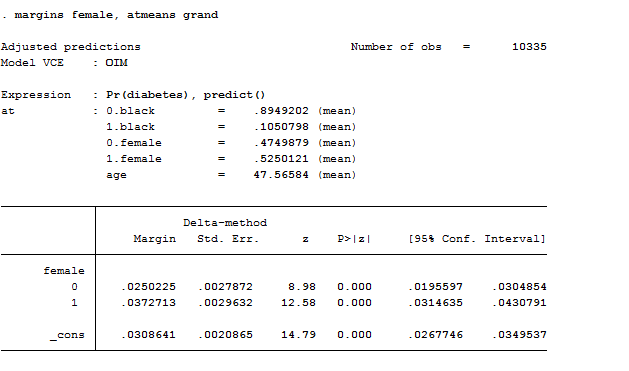 The noci option tells Stata to not display the confidence intervals of the estimates. Other options related to graphs’ editor are available at my previous post on graphs and can be all used on marginsplot. inteff depvar indepvar1 indepvar2 interaction_var1var2. Indeed, it cannot contain less than four variables and the interacted variables cannot have higher order terms, such as squared terms. If the interaction term (at the fourth position) is a product of a continuous variable and a dummy variable, the first independent variable x1 has to be the continuous variable, and the second independent variable x2 has to be the dummy variable. The order of the second and third variables does not matter if both are continuous or both are dummy variables. 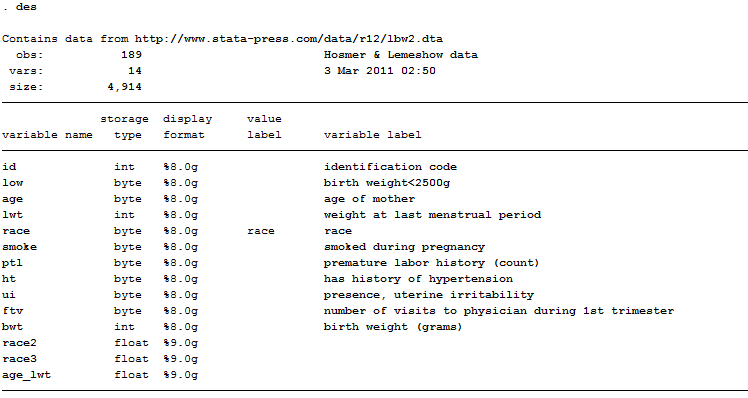 Let’s make a practical example with two continuous variables interacted using a dataset named lbw2 but known as Hosmer & Lemeshow. As you can see from the selected options you can choose to save both graphs produced and save the output. The saved file includes four variables that are the predicted probability, the interaction effect, the standard error and z-statistics of the interaction effect. You can also decide to save two scatter graphs that both predicted probabilities on the x-axis. 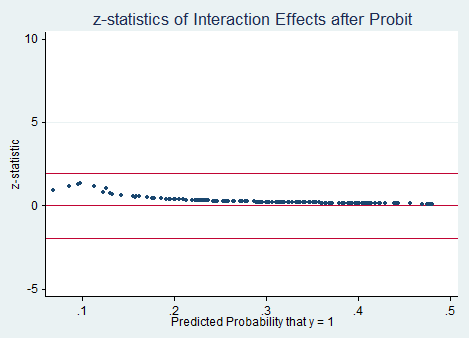 The first graph plots two interaction effects against predicted probabilities, whereas the second one plots z-statistics of the interaction affect against predicted probabilities. We may also wish to see measures of how well our model fits. This can be particularly useful when comparing competing models. The user-written command fitstat produces a variety of fit statistics as a post-estimation command but, if you want to use it, you need to install it first. In our example, this is what we get if we type the command after the probit regression. Here you have all you need to evaluate your model, starting from the AIC and BIC criteria. You don’t know what to do with them? I suggest you to check a good econometric book such as Wooldridge or Hamilton. I think for now it is time to stop here. I leave to another time the study on how to create dynamic and multinomial logit and probit!